Experience the great outdoors, history, shopping and more while staying at this Clear Lake, Iowa hotel near Clear Lake, the Surf Ballroom and Main Street. Conveniently located at the intersection of I-35 and Highway 18 (Exit 194), guests at the Best Western Holiday Lodge have easy access to the areas most popular attractions. Outdoor lovers are just one mile from sparkling Clear Lake, offering fishing, boating, jet skiing and tours aboard the two-tiered Lady of the Lake cruise ship. The surrounding area also offers ample opportunities for hiking, biking and golf. This Clear Lake hotel is within walking distance of downtown Main Streets dining, shopping, antiquing and more. Take in a concert at the legendary Surf Ballroom, the site of Buddy Hollys final performance, also just a few miles from the site of the musicians fatal plane crash. 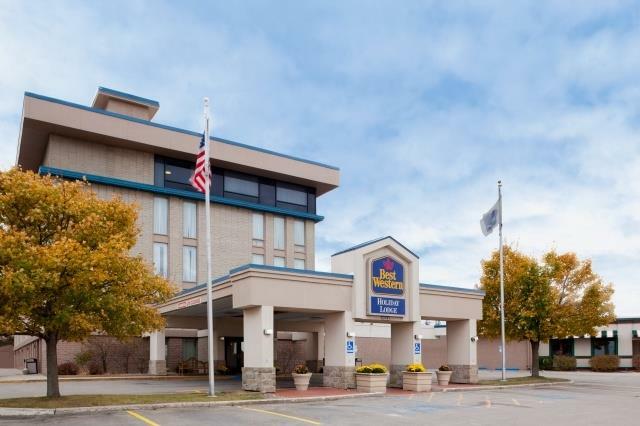 Midway between Des Moines, IA and Minneapolis, MN, the Best Western Holiday Lodge is an ideal choice for business travelers who appreciate the hotels close proximity to businesses such as Stellar , Titan Pro, CL Telephone, wind farms and the Winnebago factory in Forest City, IA. This Clear Lake hotel is also a popular event space in Clear Lake, offering nearly 6,000 square feet of flexible meeting and banquet rooms perfect for weddings and conventions. Located just a mile from the Mason City Municipal Airport, the hotel offers a complimentary courtesy shuttle. Among a few full-service hotels in Clear Lake, the Best Western Holiday Lodge strives to make our guests feel at home with participating in green projects such as the Global Soap Project. Our guests are invited to enjoy our exercise room, heated indoor pool and hot tub, and onsite restaurant, Bennigans Grill and Tavern. Contact our friendly staff today to book your next stay at the Best Western Holiday Lodge! Enjoy your stay. From: North. The Best Western Holiday Lodge is located one block west of Interstate 35 on Highway 18 at Exit 194. From: South. The Best Western Holiday Lodge is located one block west of Interstate 35 on Highway 18 at Exit 194. From: East. The Best Western Holiday Lodge is located one block west of Interstate 35 on Highway 18 at Exit 194. From: West. The Best Western Holiday Lodge is located one block west of Interstate 35 on Highway 18 at Exit 194. 0.12 mile(s) from Pizza Hut , Bar/Lounge, American, Open for: lunch, dinner, Sunday to Thursday: 11:00 a.m.-9:00 p.m., Friday and Saturday: 11:00 a.m.-10:00 p.m.
1.00 mile(s) from Cancun Mexican Restaurant, Bar/Lounge, Mexican, Open for: lunch, dinner, Monday to Sunday: 11:00 a.m.-10:00 p.m.
Bennigans , on premises, Bar/Lounge, American, Open for: lunch, dinner, for great food and Irish hospitality, 11:00 a.m. to 11:00 p.m.
4.00 mile(s) from Clear Lake State Park, beach and picnic area. 1.00 mile(s) from Clear Lake Fire Museum, open May to September. 5.00 mile(s) from McIntosh Woods State Park, beaches, camping, public boat ramps. 4.00 mile(s) from North Iowa Events Center, ice arena and horse shows. 2.00 mile(s) from Legendary Surf Ballroom, last place Buddy Holly played. Featuring concerts. 10.00 mile(s) from Mason City, Meredith Willson's Birthplace. 8.00 mile(s) from Buddy Holly Memorial, crash site of Buddy Holly, Richie Valance, Big Bopper and their piliot. New museum opened in April 2016, the world's most comprehensive collection of spiced pork artifacts. See a 12-foot-tall rocket made of SPAM cans, buy a SPAM air freshener for your car in the gift shop. ~41 miles from Clear Lake. ~51 miles from Clear Lake. Pat Acton builds impressively-detailed, giant models of buildings, spaceships, whatever, out of hundreds of thousands of wooden matchsticks. ~74 miles from Clear Lake.